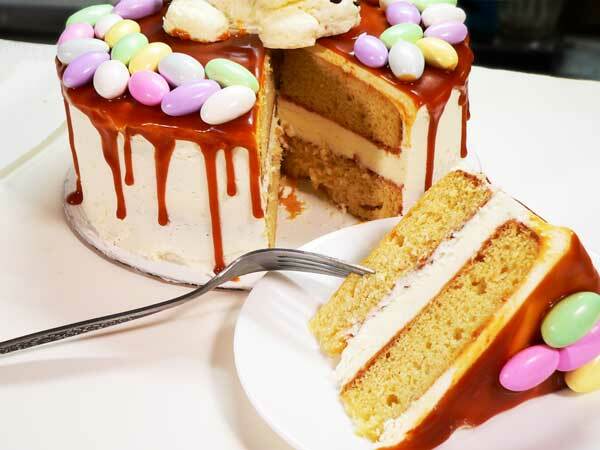 Follow our step-by-step, photo illustrated recipe to learn how to make this special Easter Bunny & Eggs Cake recipe. Golden Butter Cake layers, made from scratch. 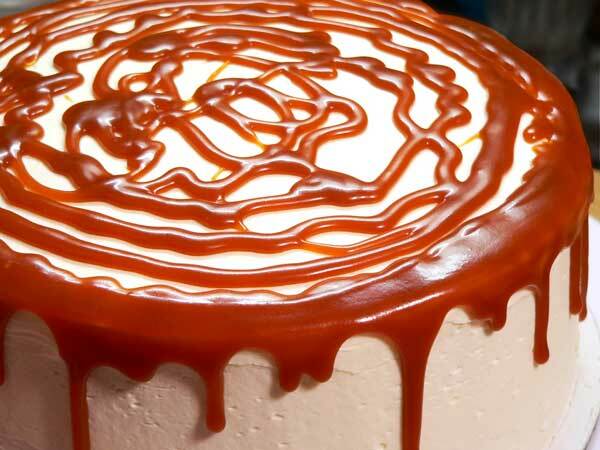 Vanilla Cream Cheese filling, Buttercream Frosting and homemade Salted Caramel Sauce on top. Decorate as desired. Printable recipe included. 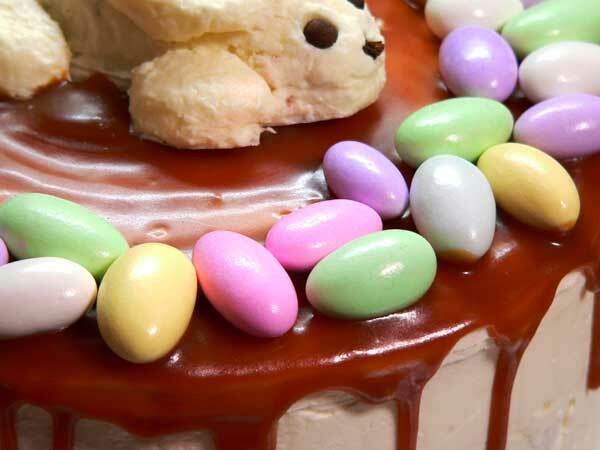 Homemade Salted Caramel Sauce drips over the sides, and we’ve decorated it for Easter with Jordan Almonds and a Bunny. Have you ever looked at something and thought, “I can do that?” Well, that’s how this particular recipe came to be here on Taste of Southern. 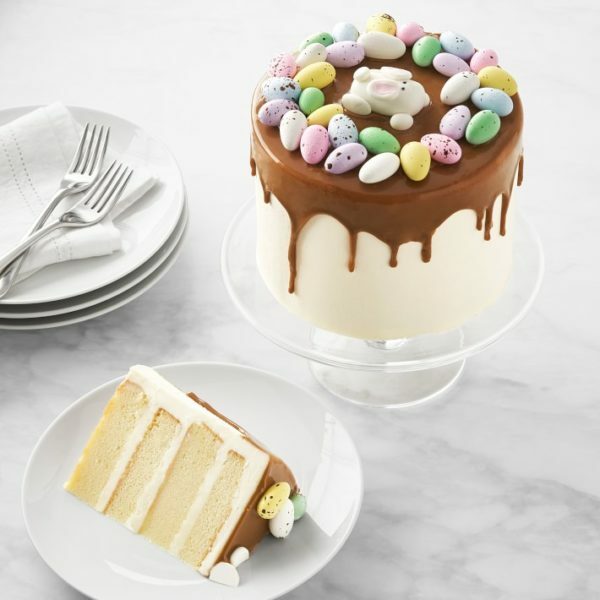 I first saw this cake on the Williams-Sonoma.com website. I guess what caught my attention most was that it was priced at $99.95. That’s a bit steep for an old country boy. And, it would cost another $18.00 in shipping to get it delivered to my door. Not that I was even thinking about buying one, but I was just curious. They listed the cake as being 6 inches round and only 4-1/2 inches in height. This confused me because their photo made it look much taller. So, I contacted their customer service and asked just to see if they might have made a mistake on the overall size. They declared in 3 separate emails that it was indeed just 4-1/2 inches tall. For comparisons sake, a dollar bill is six inches long or wide. But as I’ve stated, I did have the thought that I could do that, or at least maybe something close, so I made it my new special project. I have never claimed any skills in cake decorating, but I’ve always wished that I could do all that fancy decoration and piping stuff. Sadly, my hands aren’t stable enough to do stuff like that. So, following the information listed for the cake, I set out to do my best to re-create it here at home. I’ve broken it down for you in four parts to make it easier to follow based on the description of the cake on their website. It’s not complicated once you start breaking it down into it’s parts, and it turned out to be really moist, sweet, and delicious. At least I tried, and I’ll let you be the judge of my finished version of the cake. Again, I make no claims for any cake decorating abilities. I think I’ve made some slight improvements over the years, but then again, I don’t bake a lot of cakes for decorating. A good old yellow cake with chocolate frosting is just fine with me. Smile. Hopefully you’ll just come along for the ride and enjoy the adventure. I look forward to reading your comments in the section at the end of the recipe. All parts of the cake are mighty tasty in their own right, so maybe if nothing else, you might find one part or the other useful someday. Ready to see what the fuss is all about? Alright then, let’s head on out to the kitchen, and… Let’s Get Cooking! My Inspiration for making this cake. It was the $99.95 price tag that caught my attention most. Smile. I’m not going to supply a link to this cake because it’s only available for purchase for a limited time and the link wouldn’t be any good once they take it down. But, I wanted you to see what the original cake looked like. Photo is property of Williams-Sonoma. 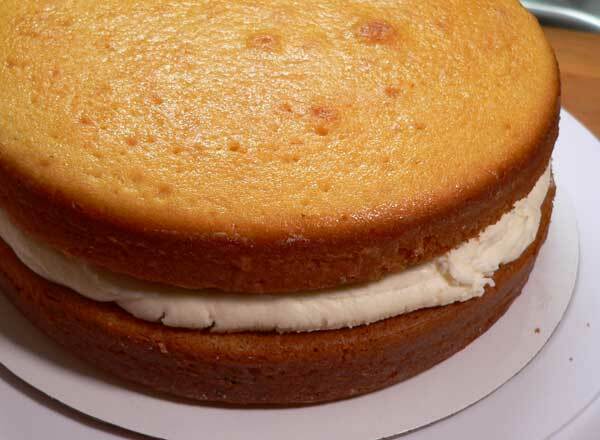 Golden Butter Cake Layers – You’ll need these ingredients to make the cake layers from scratch. 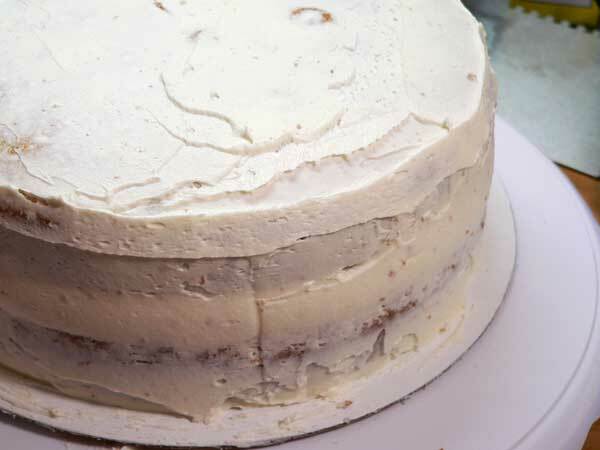 You’ll find the complete, step-by-step, photo illustrated instructions on how to make the cake layers in another post we did here on Taste of Southern. To conserve space, we’re just going to share the link with you here. It’s a really moist cake and very easy to make. 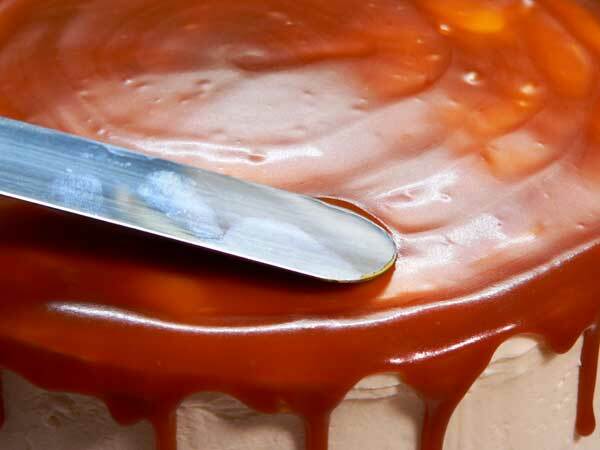 Homemade Salted Caramel Sauce – you’ll need these ingredients. We’re going to make the caramel sauce first so it has plenty of time to cool down. It’s much easier than you might think and much better than the stuff you’d buy in the store. It will keep in the refrigerator for months and it’s a great topping for ice cream as well as for our cake. Place the sugar in a medium sauce pot and place that on a COLD burner. Gently add water. Set heat to Medium and let the sugar come to a boil. DO NOT STIR. It will take a few minutes, but watch for the syrup to start turning an Amber color. DO NOT STIR. When the sugar turns Amber colored – REMOVE the pot from the stove top. STIR QUICKLY once you add the butter. It will try to boil up out of the pot. It’s hot, be careful. Add the cream slowly, stirring as you go. Now, add the salt to the caramel and quickly stir that in. 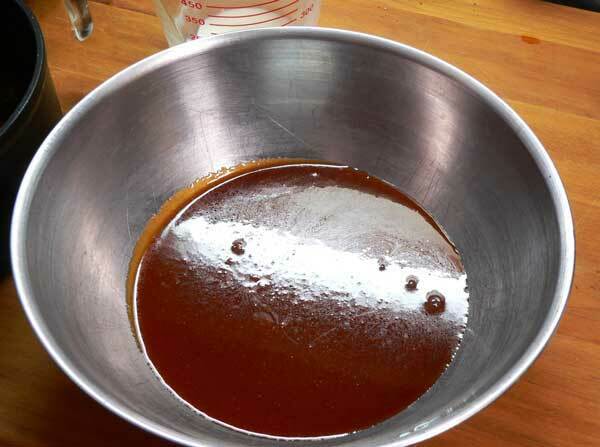 Pour the caramel sauce into another container and let it cool. It will take a very long time to cool if you leave it in the pot you made it in. A stainless steel bowl works great for this. Set it aside until needed. 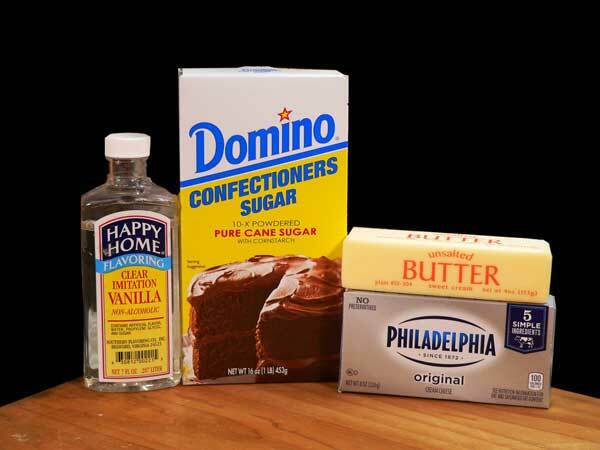 Vanilla Cream Cheese Filling – You’ll need these ingredients. Place the cream cheese and butter in a medium sized mixing bowl. Cream together with a hand mixer until smooth. Gradually add the powdered sugar, mixing as you go. Scrape down the sides of the bowl as needed. Mix the ingredients together until creamy and smooth. Add the vanilla. I’m using a clear vanilla flavoring but any vanilla flavoring will work. Mix again until fully combined and smooth. Set aside for now. You want the filling to be somewhat stiff, so add more powdered sugar if needed. A somewhat stiffer filling will support the layers better. 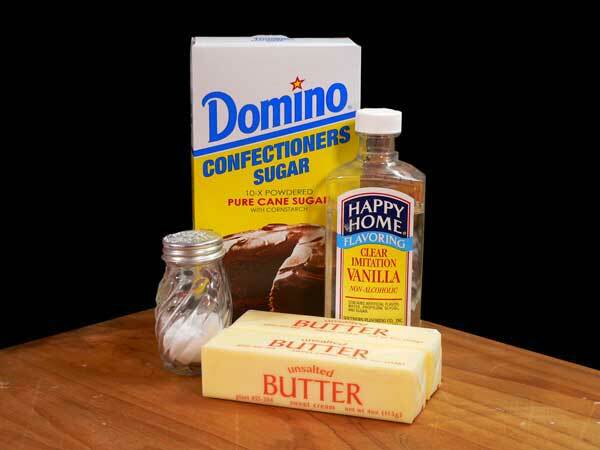 Buttercream Frosting – You’ll need these ingredients. Place the softened butter in a medium sized mixing bowl. Cream the sticks of butter together until smooth. Gradually add the confectioner’s sugar, mixing as you go. Mix all the ingredients together until creamy and smooth. Set aside for now. Place a dab of the filling on your cake board or plate. This helps hold the layer in place. Center your layer on the board. I used a pastry bag to pipe a large border of the filling around the outside edge of the layer. Pipe in several more lines of the filling to cover the biggest part of the layer. It doesn’t have to be perfect by any means. Obviously… right? Smile. Use a spatula and smooth out the filling on top of the layer. Try to keep the filling the same thickness all across the top of the layer. Center the next layer on top of the filling. Smooth the filling out all around the edges of the cake. I’m only using two layers and as you can see, I’ve got a big thick layer of filling in between them both. 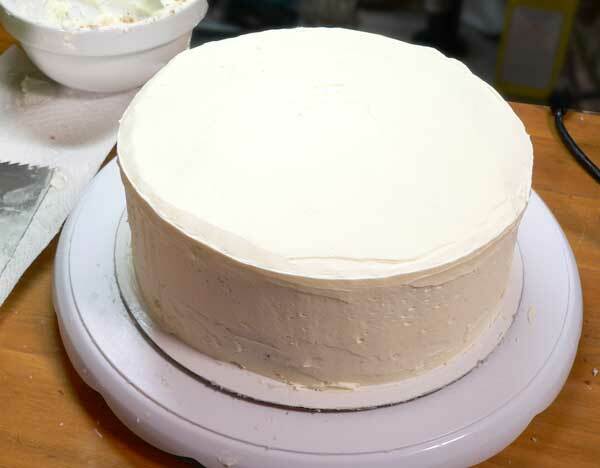 Lets crumb coat the outside of the cake with our Buttercream Frosting. 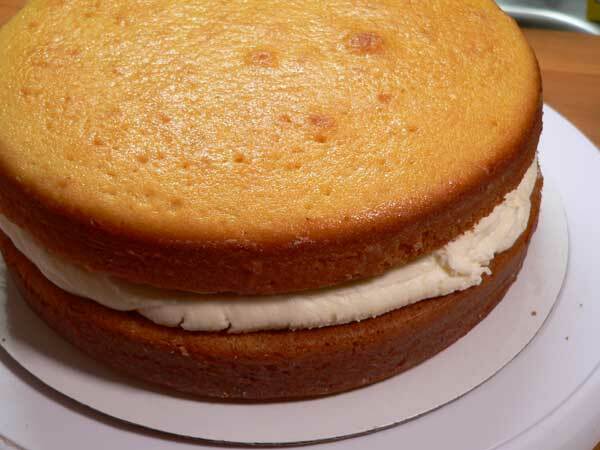 Crumb Coat is where you apply a thin layer of frosting to the top and the sides of your cake. It needs to be pretty smooth when you’re finished with it, smoother than how this looks. This crumb coat will help seal in any loose crumbs on your cake so they don’t show up in the frosting once your cake is finished. Smooth it out all around the outside layers and on the top. 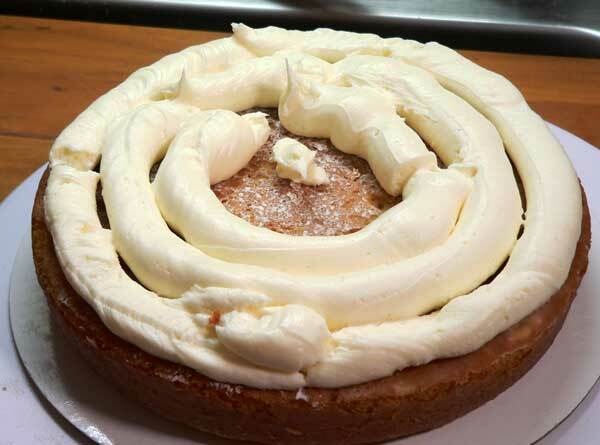 Again, we’re using our Buttercream Frosting for this part, not the filling. Place the crumb coated cake in your refrigerator for about 30 minutes so the frosting will have time to firm up. You don’t have to cover the cake, just sit it on one of the racks. This is the part you’ll probably want to spend the most time on. I don’t claim to have any skills when it comes to decorating a cake and I think that’s probably pretty obvious. Smile. Just give yourself plenty of time to try and get the layer of frosting as even and smooth as you can. 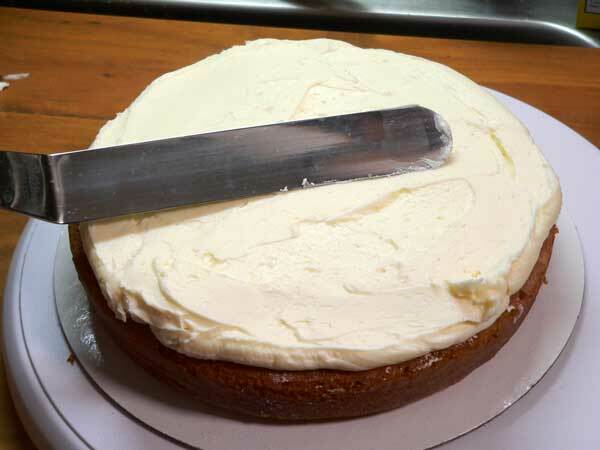 Spread a layer of the Buttercream Frosting around the sides with a spatula, then across the top. The good part is – it’s frosting – so you can go back over an area at this point and keep working on it until it starts looking like you want it too. Place the cake, uncovered, back in the refrigerator for at least another 30 minutes to let the Buttercream Frosting firm up a bit. I let mine stay for over an hour to be sure it was good and cold. 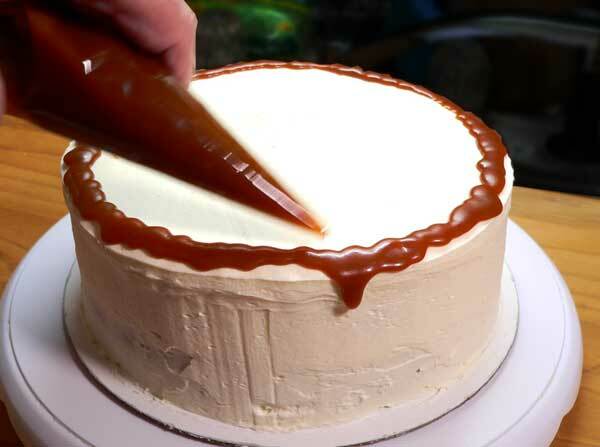 Drizzle some caramel sauce around the edge of the cake. I placed a cup or so of the caramel sauce in another piping bag and cut off the tip. 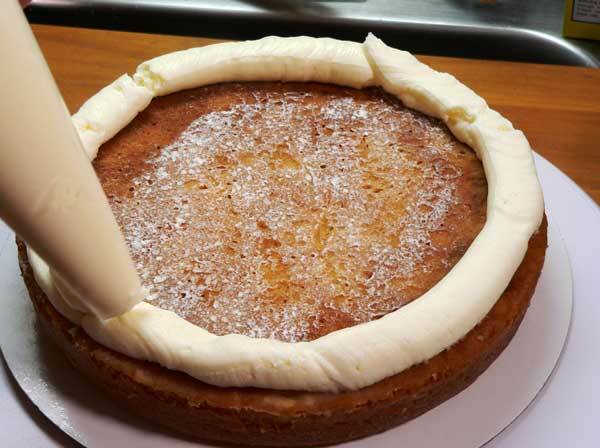 Then, I tried to carefully drizzle some of the sauce around the outer edge of the top of the cake. The caramel sauce was at room temperature and the cake was good and cold. I knew the sauce would run a good bit so I didn’t place it directly on the edge as you can see, just kind of close to the edge. Then, I added a bit more sauce to various points to try and get it to drip over the side. Just take it slowly and don’t rush yourself. Once the outer barrier of sauce was established, I went back and drizzled extra sauce in the center of the cake top and out towards the edge. I think it looks pretty good just like this. Smile. Using a spatula again, I slowly worked the sauce from the center out to smooth it across the top. You can see where it’s dripping down the sides. Then, I arranged the Jordan Almonds around the outside edge of the cake and placed my Bunny Rabbit in the very center of the top. I made the rabbit out of leftover buttercream frosting that had started to firm up. Okay, give me credit for trying anyway. Pretty please! 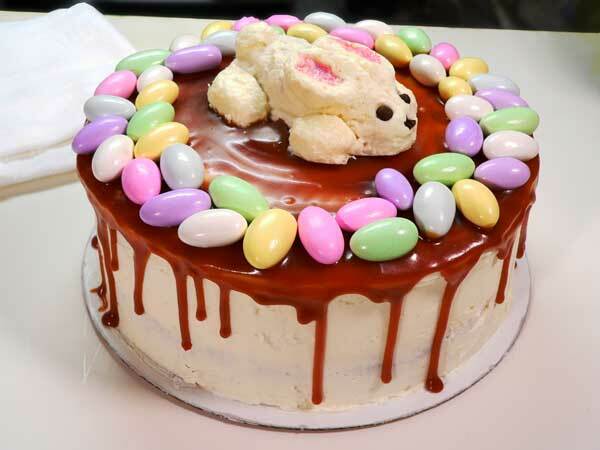 And here it is, my version of the Easter Bunny & Eggs Cake. My rabbit is smiling, but I didn’t do that intentionally. It just looks that way for some reason. And, the caramel dripped a bit more than I wanted it too once the cake started to warm up some. I was really pleased with the Golden Butter Cake Layers and how they turned out. They were moist, and they held up well throughout the decorating process. I also ended up with a very nice thick layer of the Vanilla Cream Cheese Filling in the middle of the cake as you can see. This turned into a labor of love. It’s not all that difficult despite what you might think from all the steps and photos involved. You could even skip the filling and just use the frosting in between the layers but you might need to make some extra. It was sweet, no denying that, but the Salted Caramel Sauce helped with that. I’m giving myself a B+ for effort alone. 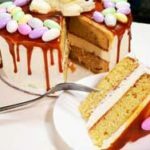 Ingredients and instructions for making the filling, frosting, and caramel drip topping for our Easter Bunny & Eggs Cake Recipe. 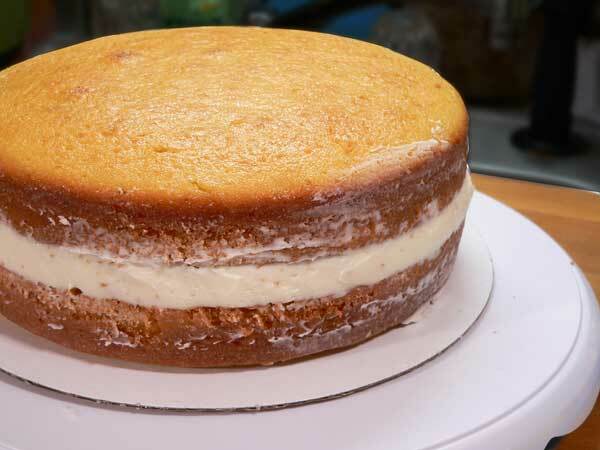 You’ll also need the recipe for our Golden Butter Cake Layers to complete the recipe. 1 cup Powdered Sugar, plus more if needed. Place the cream cheese in a medium sized mixing bowl. Using a hand mixer, cream the cheese and butter together until smooth. Gradually add the sugar and mix until combined. Add the vanilla, mix until smooth. Filling should be thick enough to hold up between layers. Add more sugar if needed. Spread between the layers of your cake. Place the butter in a medium sized mixing bowl. Use a mixer and mix for several minutes on medium speed until smooth. 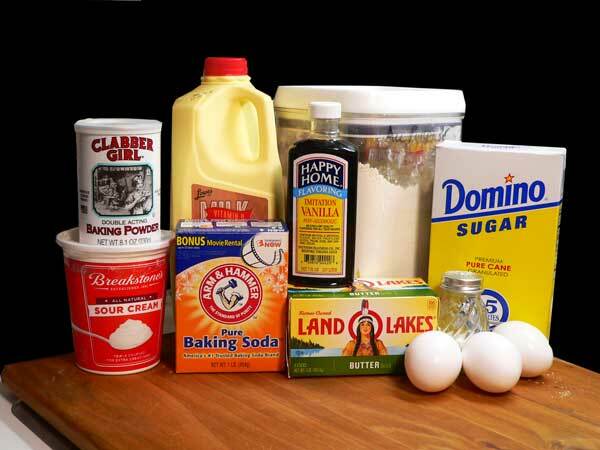 Gradually add the confectioner’s sugar, beating on low speed until sugar is well incorporated. Increase mixer speed to medium, beat for about 3 minutes until creamy as desired. CAUTION – Sugar can get very hot, please be careful and avoid splatters to the skin. Place sugar in a medium saucepot over a COLD burner. Swirl the pot to even out the sugar. Slowly add the water, trying not to disturb the sugar very much. DO NOT STIR. Turn heat on to just below Medium heat. Do not stir at all, but let the sugar dissolve and start to boil. Let boil until sugar turns to a light amber color, still not stirring. Be patient. Once it turns a light amber color, remove the pot from heat. 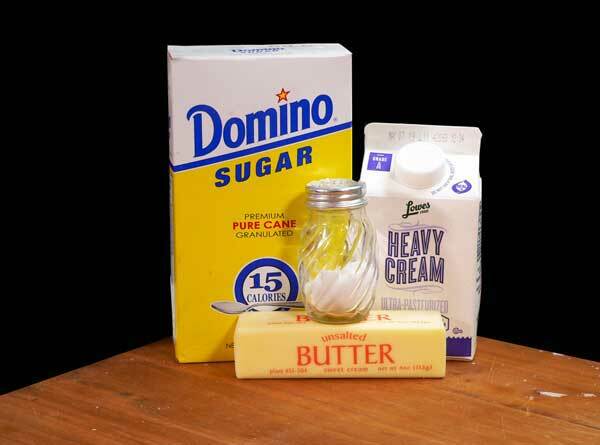 Stir butter into sugar until fully melted. Careful, it tends to try to boil over. Slowly add the cream, stirring constantly. Add the salt. Stir well to combine. When fully combined, place the mixture in a metal bowl and let cool completely. Allow to cool before pouring on cake. It thickens as it cools. This cake isn’t complicated despite all the steps involved. I baked the cake layers, and made the Salted Caramel Sauce on one day then covered and stored them overnight. I made the filling and the frosting the second day and then assembled the cake. Just plan the recipe to suit your schedule best. Would you pay 100.00 for a cake? What type of cake would that be? Would you make our cake? It will only take a minute or two for you to leave your comments in the section below. Did you figure up how much the same cost you? Just curious. I am very impressed with your Easter cake!! It is beautiful and I know it is beyond delicious. I truly appreciate your effort to show motivate your fans to try new ideas and techniques in cooking/baking. Thank you. I think I’ll give you an “A” and it’s a beautiful cake. You did a great job. Kudos for a job well done. And, yes, I would pay $100 for a cake but only one that had 2 $100 bills in it and free shipping. Steve, your cake is lovely! Thank you for the recipe and the step by step instructions. I can’t wait to make this. I love your stories; please keep them going. My grandmother used to buy salt-rising bread from A&P in Charlotte. It was her morning toast. I’ve not had any since visiting her 50 years ago. I look forward to your starter recipe. I’ve made lots of sourdough bread. Is the starter similar? Do you know of any stores that sell salt-rising bread? I give you an A+! It looks fabulous! Your cake is beautiful. Thank you for having the courage to show us that it can be done and for giving us all encouragement to try new things. Enjoy that cake and God Bless.